Did you know there’s a range of parking options within a five-minute walk of anywhere in the city centre? 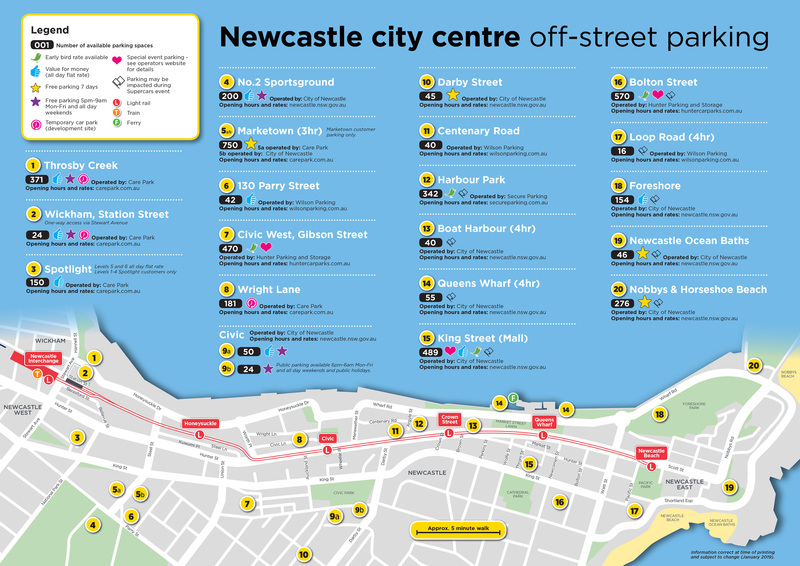 There are 20 off-street parking sites in Newcastle city centre and many of them offer all day parking for reasonable fees. Parking meters are located throughout the city centre. If you are parking on the street in a metered area, please check kerbside signs for hours of operation, payment options and prices. Outside the times indicated on the signs, parking is free and unrestricted; however in some instances other parking conditions may apply. Please always check the information on the kerbside before you park your vehicle. City of Newcastle offers 15-minutes free parking to customers using the EasyPark app in all 1P and 2P paid parking areas. There is no longer an option to obtain a free 15 minute ticket from the parking meters. The free 15 minutes will be automatically applied to all EasyPark parking sessions in 1P and 2P ticket parking areas. After the first 15 minutes, users will be charged at the normal EasyPark hourly rate.